In Part V, we discussed the end of the rising cycle. There was a conflict between commodity speculation and leverage. Leverage won. Liquidations impaired bank balance sheets, and the result was a spike in the interest rate. It finally rose over marginal time preference. Unfortunately, it rose over marginal productivity as well. Slowly at first, the bond market entered a new bull phase. It becomes ferocious, as it pushes down the interest rate which bleeds borrowers of their capital. Companies find it harder to make money and easier to borrow. They are obliged to borrow to get a decent return on equity. In short, they become brittle. In this Part VI, we look at The End. At the beginning of Part I, I noted in passing that we now have a positive feedback loop that is causing us to spiral into the black hole of zero interest. 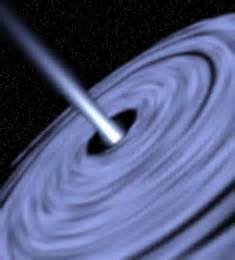 In astrophysics, the theory says that a black hole is a singularity with infinite gravity at the center. 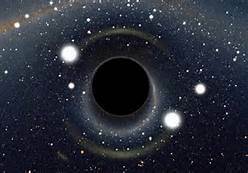 There is a radius called the event horizon, and everything including light that gets inside this radius is doomed to crash into the singularity. For years, I have been thinking that this is a perfect analogy to the falling rate of interest. At zero interest on long-term debt, the net present value is infinite. There is a positive feedback loop that tends to pull the rate ever downward, and the closer we get to zero the stronger the pull. But an analogy is not a mechanism for causality. In the fall of 2012, I attended the Cato Institute Monetary Conference. Many of the presenters were central bankers past or present, or academics who specialize in monetary policy. It was fascinating to hear speaker after speaker discuss the rate of interest. They all share the same playbook, they all follow the Taylor Rule (and indeed John Taylor himself presented), and they were all puzzled or disappointed by Fed Chairman Bernanke not raising interest rates. Their playbook called for this to begin quite a while ago now, based on GDP and unemployment and the other variables that are the focus of the Monetarists. The Chairman is like the Wizard of Oz. He creates a grand illusion that he is all-powerful. When he bellows, markets jump. But when the curtain is pulled back, it turns out that he has no magical powers. At that conference, after hearing so many speakers, including some of Bernanke’s subordinates, discuss when and why and how much the rate should be higher, I became certain that it is not under his control. It is falling, falling. One cannot go from analogy to theory. It has to be the other way around. And yet, the black hole analogy corresponds to the falling rate in several ways. First, zero interest is like a singularity. I have repeatedly emphasized the fact that debt cannot be paid off; it cannot go out of existence. It is only shifted around. Therefore, regardless of whatever nominal duration is attributed to any bond or loan, it is in effect perpetual. At zero interest, a perpetual debt has an infinite net present value. There is also a causal mechanism for the falling interest rate. As discussed in Part V, the interest rate is above marginal productivity. So long as it remains there, the dynamic is given motive power. In Part V, we discussed the fact that due to the arbitrage between interest and profit, at a lower interest rate one will see lower profit margins. This is what puts the squeeze on the marginal business, who borrowed previously at a higher rate. The marginal business is unable to make a profit when competing against the next competitor who borrowed more cheaply. It is worth saying, as an aside, that this process of each new competitor borrowing money to buy capital that puts older competitors out of business who borrowed too expensively is a process of capital churn. It may look a lot like the beneficial process of creative destruction, but it is quite different. Churn replaces good capital with new capital, at great cost and waste. In falling rates, no one has pricing power, and generally one must borrow to get a decent return on equity. The combination of soft consumer demand, shrinking margins, and rising debt makes businesses brittle. Consumer demand is softened by the soft labor market. The labor market is soft because there is always a tradeoff between labor and capital invested. For example, in India Wal-Mart does not use automation like it does in the US. Labor is preferred over capital, because it is cheaper. With falling interest rates, capital equipment upgrades become a more and more attractive relative to labor. Many attribute the high unemployment to high minimum wages and generous welfare schemes. This is part of it, but it does not explain unemployment of skilled workers and professionals. As the interest rate falls, the marginal productivity of labor rises. This may sound good, and people may read it as “productivity rises” or “average productivity rises”. No, it means that the bar rises. Each worker must get over a threshold to be employed; he must produce more than a minimum. This threshold is rising, and it makes more and more people sub-marginal. Unemployed people do not make a robust bid on consumer goods. The next-to-final element of the analogy is the event horizon. In the case of the black hole, astrophysicists will give their reasons for why everything inside this radius, including light, must continue down into the singularity. What could force the interest rate to zero, once it falls below an arbitrary threshold? Through a gradual process (which occurs when the rate is well above the event horizon), the central bank evolves. The Fed began as the liquidity provider of last resort, but incrementally over decades becomes the only provider of credit of any resort (see my separate article on Rising Interest Rates Spoil the Party). Savers have been totally demoralized, discouraged, and punished. Borrowers have become more brazen in borrowing for unproductive purposes. And total debt continues to rise exponentially. With lower and lower rates offered, and higher and higher risk, no one would willingly lend. The Fed is obliged to be the source of all lending. A proper system is one in which people produce more than they consume, and lend the surplus, which is called “savings”. The current system is one in which institutions borrow from the government or the Fed and lend at a higher rate. Today, one can even borrow in order to buy bonds. Most in the financial industry shrug when I jump up and down and wave my arms about this practice. Other than a bank borrowing from depositors (with scrupulously matched duration!) there should not be borrowing to buy bonds. A free market would not offer a positive spread to engage in this practice, and rational savers would withdraw their savings if they got wind of such a scheme. Thus, the system devolves. Sound credit extended by savers drives a proper system. Now, the Fed becomes the ultimate issuer of all credit, and this credit is taken from unwilling savers (those who hold dollars, thinking it is “money”) and is increasingly extended to parties (such as the US government) who haven’t got the means or the intent to ever repay it. The actual event horizon is when the debt passes the point where it can no longer be amortized. Debtors, especially the ultimate debtors that are the sovereign governments, and most especially the US government, depend on deficits. They borrow more than their tax revenues not only to fund welfare programs, but also to pay the interest on the total accumulated debt. That singularity at the center beckons. Every big player wants lower rates. The government can only keep the game going so long as it can refinance its old debts at ever-lower rates. The Fed can only pretend to be solvent so long as its bond portfolio is at least flat, if not rising. The banks’ balance sheets are similarly stuffed with bonds. Businesses, long since made brittle by three decades of falling rates, likewise depend on the bond market to roll their old bonds by selling new ones. No debt is ever repaid, because there is no mechanism for it. An ever-greater total debt burden must be refinanced periodically. Lower rates are the enabler. Recall from Part IV that the dollar system is a closed loop. Dollars can circulate at whatever velocity, and they can circulate to and from any parties. For interest rates, what matters is whether net credit is being created to finance net increases of commodities and inventories, or whether net sales of commodities are used to finance net purchases of bonds. The spreads of interest to time preference, and productivity to interest determine the direction of this flow. So long as the interest rate is higher than marginal productivity and marginal time preference, the system is latched up. So long as the consumer bid is soft and getting softer, marginal productivity is falling. So long as debtors are under a rising burden of debt, and creditors have the upper hand, then time preference is falling. The final element of our analogy to the black hole is that, according to newer theories that may be controversial (I don’t know, I am not a physicist, please bear with me even if the science isn’t quite right) if enough matter and energy crash into the singularity quickly enough, then it can cause an enormous explosion. Here is my prediction of the end: permanent gold backwardation. The lower the rate of interest falls, the more it destabilizes the system because it makes the debtors more brittle. The dollar system has, to borrow a phrase from Ayn Rand, blackmailed people not by their vices, but by their virtues. People want to participate in the economy and benefit from the division of labor. Subsisting on one’s own efforts alone provides a very low quality of life. The government forces people to choose between using bogus Fed paper vs. dropping out of the economy. People naturally choose the lesser of these two evils. But, as the rate of interest falls, as the nominal quantity of debt rises, as the burden of each dollar of debt rises, and as the debtors incur ever-greater risks, the marginal saver reaches the point where he prefers gold without a yield and with price risk too, over bonds even with a yield. We are in the early stages of this process now. A small proportion of the population of Western countries is buying a little gold, typically a small proportion of their savings. What happens when this process accelerates, as it must inevitably do? What happens when people will borrow dollars to buy gold, as they had borrowed dollars to buy commodities in the postwar period? By then, the bond markets may be so volatile that this could cause a spike in interest rates. Or it may not. It will pull all the remaining gold out of the bullion market and into private hoards. At that point, gold will begin to plunge deeper and deeper into backwardation. As I explained in my dissertation, a persistent and significant backwardation in gold will pull all liquid commodities into the same degree of backwardation. Desperate, panicky people will buy commodities not to hoard them or consume them, but as a last resort to get through the side window into gold after the front door is closed. When they cannot trade dollars for gold, they can trade dollars for crude oil and then trade crude oil for gold. Of course, this will very quickly the drive prices of all commodities in dollars to rapidly skyrocket to arbitrary levels. At that point, there could even be a short-lived rising cycle where people sell bonds to buy commodities, or this may not occur (it may be over and done too quickly). In any case, this is the final death rattle of the dollar. People will no longer be able to use the dollar in trade, even if they are willing (which is quite a stretch). Then the interest rate in dollars will not matter to anyone. My description of this process should not be taken as a prediction that this is imminent. I think this process will play out within weeks once it gets underway, but that the starting point is still years away. The interest rate on the 10-year Japanese government bond fell to 80 basis points. I think that the rate on the US Treasury can and will likely go below that. We must continue to watch the gold basis for the earliest possible advance warning. This completes the series on interest and prices. There is obviously a lot more to discuss, including the yield curve and what makes it abruptly flip between normal and inverted, and of course mini rising cycles within the major falling cycle such as the one that is occurring as I write this. I would welcome anyone interested in doing work in this area to contact me at keith (at) goldstandardinstitute (dot) us. To briefly address the 80% increase in the 10-year interest rate over the past few months: it is a correction, nothing more. The rate will resume its ferocious descent soon enough. This entry was posted in Monetary Science on September 18, 2013 by Keith Weiner. What idiotic, institutionalized economic departments world wide won’t teach you. Click on all the links to the series and educate yourselves my friends. My pleasure Keith. Please keep up the great work. Keith, why would people necessarily flee to gold and commodities to get of a currencies downward spiral. Why not stocks? Even if markets are slow there will still be demand for necesseties and there will still be some yield in stocks while gold yeilds nothing. Dan, thank you for your question. When you say “yield” do you mean payment in the form of dollars? Also, equity is the least secure part of a corporation’s capital structure. If the debt is rising exponentially, and the quality of the debt is falling, and the consumer is under increasing stresses of his own (including unemployment and rising debt) then the equity layer becomes increasingly dubious. The point of owning gold, i.e. money, is not to get a yield but to avoid the risk of exposure to unpayable debts. Thanks for taking the time to reply. It’s been very interesting to read these articles. I think I get your point about gold vs equities. You write that the end of the falling cycle would be sometime after interest rates move below marginal productivity. Do you think Japan is close to that point? Can such a big developed country reach the end of the pendulum while other countries still gravitates towards it or wouldn’t that cause a world wide turn of the cycle when that happens? Do you have any thoughts yet on counter cycles within a long term trend? Hi Keith, great article! I am going to have to reread a few times to absorb it all. Can you comment on the negative rates and how that plays into your theory of interest? Thank you. I wrote several pieces about negative interest rates in Switzerland. They are on my Forbes page and on my company site monetary-metals.com. May be a silly question, but if there was a large bond sell-off before permanent and expanding gold backwardation and the fed could no longer issue debt on the open market. If they continued to augment the debt by bypassing the bond market; purchasing bonds directly from the treasury. Do you think this would trigger another rising cycle? Bond speculation could no longer occur (at least in the same sense) and so, would deflation quickly turn into inflation? Marginal time preference would be launched into orbit or destroyed completely, at least in terms of fiat interest rates. Do you think this would cause gold backwardation to happen more quickly, or would it be more like you described in part IV with the hoarding of production inventories? Your thoughts would be very helpful. I don’t see that happening. Remember, the dollar is backed by the bond but pays no yield. Why would someone prefer a dollar to the bond? And unless you have only a small amount of dollars which you can hold as paper notes, you add banking system counterparty risk. And the bank buys bonds with your deposit anyways! I don’t mean to hold dollars instead of treasury’s, but to purchase commodities. If they questioned the solvency of the debt as it reached ‘critical mass’ but gold backwardation hadn’t occurred, bonds could still be liquidated and spent in the commodities market? Or do you think this is still very unlikely? For example, if China decided to liquidate a sizeable portion of their treasury bonds and caused a panic. China could, in theory, sell their dollars, and make the dollar go down relative to whatever other currency they buy. But if they hold dollars, it has to be Treasurys. If you have $100, you can put it in your pocket. If you have $100,000 you can put it in the bank. But if you have $100,000,000,000 into Treasurys it must go. There are other reasons why China can’t really sell their dollars. And there is another issue. Nearly everyone is in debt. They need to hold cash balances as part of their debt-servicing plans.